This article is about the year 1427. Wikimedia Commons has media related to 1427. 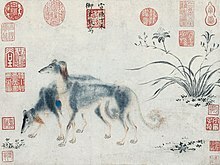 The Ming Dynasty Xuande Emperor paints a picture of his dogs. January–Spring – Radu II of Wallachia resumes the throne for the fourth time, but a seven-year struggle for it ends when he is defeated in battle, and probably killed, by Dan II, who resumes the throne for a fifth term. April – The House of Balsic's rule of Montenegro comes to an end with the death of Balša III. August 4 – Hussite Wars: Battle of Tachov – The Hussites decisively beat the crusader armies, ending the Fourth Anti-Hussite Crusade. August 17 – The first band of Gypsies visits Paris, according to an account of the citizens of Paris. October 13 – Lincoln College, a constituent college of the University of Oxford in England, is founded by the Bishop of Lincoln. The Celestine Order is established in France. The Celebration of Sant Jordi (Saint George) begins in Catalonia (he will later become its patron saint). Battle of the Echinades: A Byzantine fleet defeats the fleet of Carlo I Tocco. Itzcoatl becomes the 4th Tlatoani of Tenochtitlan, after his nephew Chimalpopoca is killed by the Maxtla, at Azcapotzalco. Bhaktapur Royal Palace (in Nepal) is built by King Yaksa Malla. ^ The History of the Feuds and Conflicts Among the Clans in the Northern Parts of Scotland and in the Western Isles: from the year M.XX1 unto M.B.C.XIX, now first published from a manuscript wrote in the reign of King James VI. Foulis press, 1764.